This small-scale iron truss was fabricated in 1891 by the King Iron Bridge Company of Cleveland and erected in the small town of Ulysses, near the southern edge of Butler County. 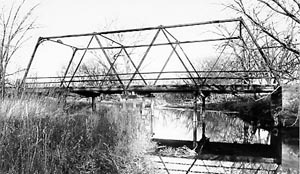 In 1928 the county moved the truss to its present location over Clear Creek, a tributary of the Platte River. Here it has since carried relatively light, local traffic. Timber and steel piles have more recently been placed under the floor beams, effectively converting the truss into a series of simple stringer spans. Despite these alterations, the Clear Creek Bridge is technologically significant as one of the last representatives in the state of this exceedingly rare structural type. The Warren truss configuration was first patented in 1848, but it did not receive widespread acceptance as a vehicular truss type until the development of rigid-connected technology after the turn of the century. Pin-connected Warren trusses are therefore uncommon in Nebraska and the Midwestern United States.